I like mysteries, and if one isn't happening around me, I'll find one! I find many things to be a mystery, many things that open the avenue of curiosity and inspire me to delve deep into the mystery of it all. 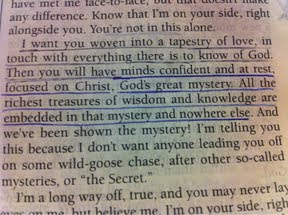 The biggest mystery I've encountered is Christ! I will never know all there is to know, He is so deep and wide that the mystery continues to unfold. Because of Who He is, I want more. I want to talk to Him, explore Him, share Him, speak of Him, discover Him, revel IN Him, love Him, be like Him. And, as He daily works IN me, the mystery grows. Jesus, show me more of who You are, reveal the mystery of Your heart to me, deeper and deeper. Bring me INTO Yourself and grow me. Say That Again, Jesus, You are the only true Mystery, for In You all the answers are brought to life! Three of my children were born in a very sad place where tears were never dried, bedtime prayers & stories were never heard of in this sad place. They have many good & happy times now that they are home, but they are not so sure about trusting and question motives constantly. Anything good is a mystery to them... Because why would someone do something without expectations?... They think. Lord speak to and soften my loved ones hearts. Help them to seek and feel the mystery your unending, unconditional love.